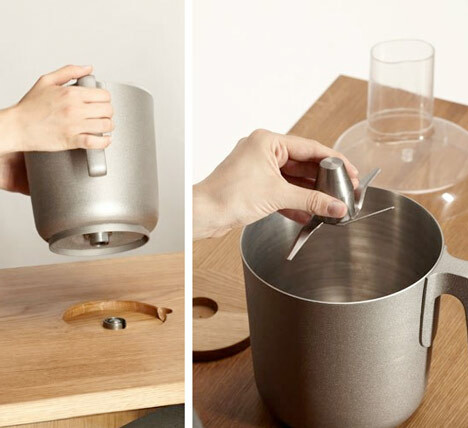 German graduate designer Christoph Thetard has created a set of pedal-powered kitchen gadgets. 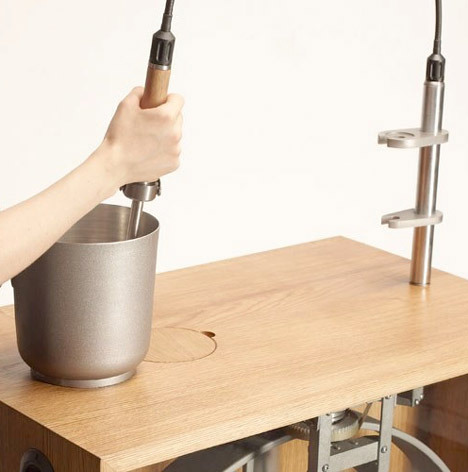 Called r2b2, the appliance includes a hand blender, coffee grinder and food processor that fit onto a wooden unit containing a pedal-powered drive mechanism. 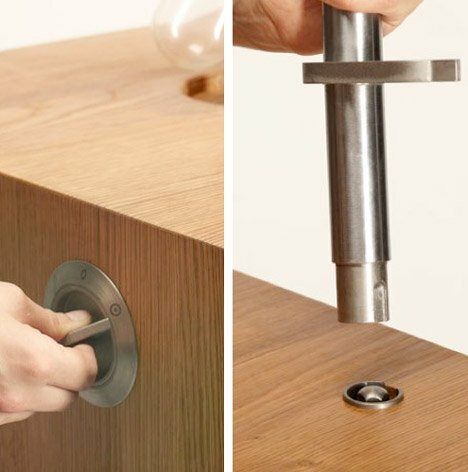 Thetard developed the product as his final project at Bauhaus-University Weimar. The appliances can be stored in a pull-out cabinet on one side of the unit. 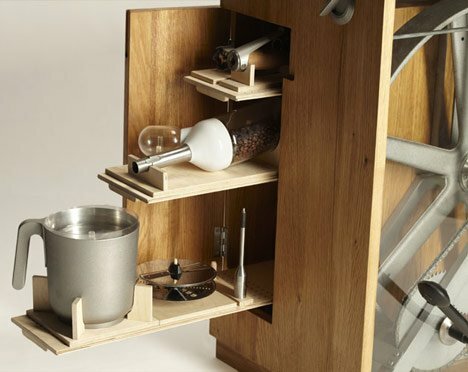 The kitchen unit is part of a diploma project by Thetard to create products that do away with the need for electricity and it will be shown at Ambiente Talents, Frankfurt in February 2011 and Salone Satellite, Milan in April next year. 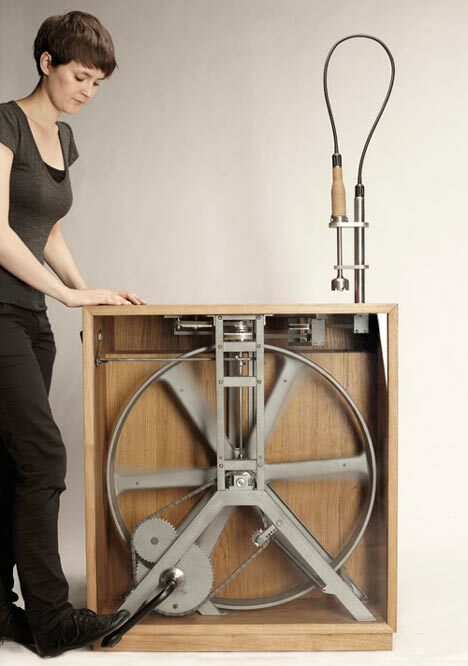 R2B2 is a set of kitchen machines that gets powered by rotating a flywheel with muscular strength. The stored energy can be used by connecting different machines on special plugs. There is a kitchen machine, a hand blender and a coffee mill. Electricity is not necessary anymore. That means no electrical waste, a load less use of resources, independency of the electrical power grid and almost no noise while in use. The hand blender can be used for different works by attaching different tops. 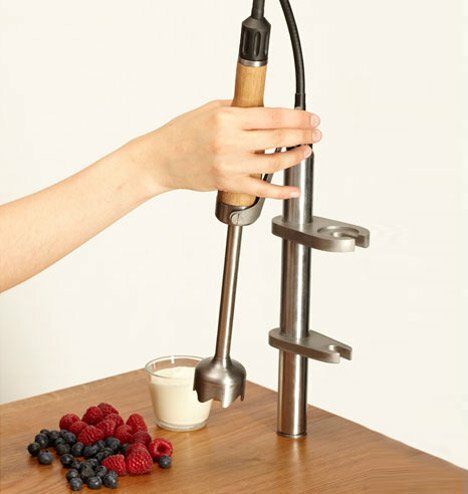 A flexible shaft leads the rotation noiseless to the handheld and powers a blender, an egg or a cappuccino creamer. The transmission makes a speed up to 10.000 rpm possible. The hand blender can be stored on a holder on the bottom end of the shaft for daily use. It can be used for different works by attaching different tops. 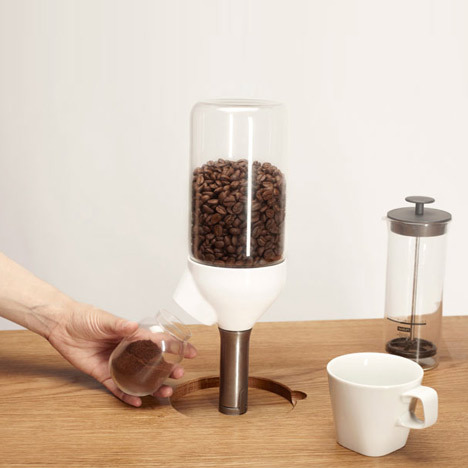 The coffee grinder is storage and mill at once. The bean container and the powder container are made out of glass. There is room for 300g of beans. The main part of the mill with the grinder is made out of porcelain and closes the whole coffee grinder aroma-tight. It is possible to grind beans for 10 cups of coffee at once. The big opening of the glasses guarantees easy excess to clean. The kitchen machine is laid out for four people. For the multifunctional use there are blades, a whip and different adapters for cutting slices. To clean the machine, you can easily reassemble the axle from the bowl. One criterion to choose the attachments was the aim to provide the possibility to do as many different jobs with as less as possible parts. All appliances can be placed in the container. The main part of the transportation and selling packaging can be used to hold the attachments in place. All attachments will be sold separately. That means that you can buy just the parts you need. During his final project, Christoph Thetard concentrated on sustainability. Regenerative energy seems to be the solution for the problems of energy supply. That puts people into the temptation to use electrical devices in all kinds of products. But it creates another problem that already exists today: The production of electrical waste and the loss of resources. So the target of this project wasn’t to make electrical appliances more sustainable, but to avoid electricity completely. 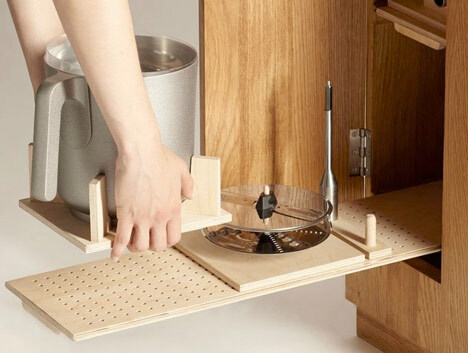 R2B2 combines three kitchen appliances and a central driving unit. 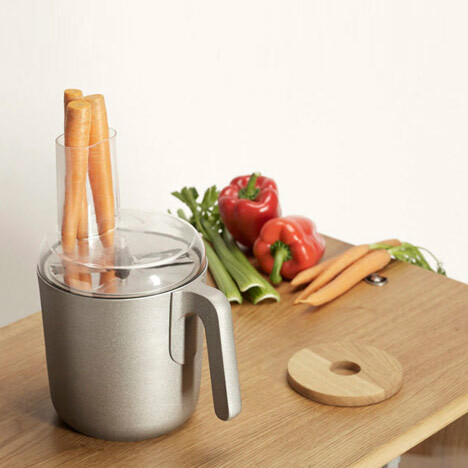 A kitchen machine, a coffee grinder and a hand blender were chosen after extensive studies to stand representatively for a lot of appliances which are essentials for comfortable cooking. 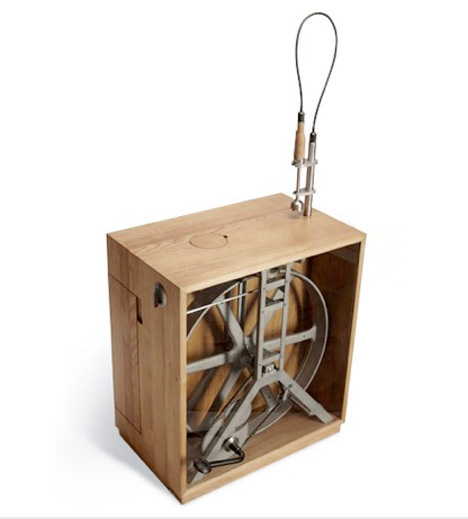 The heart of the driving unit is a flying wheel, which gets powered manually by a pedal. It works as an energy storage and powers the appliances mechanically and directly. Because of splitting the machines in functional attachment and power unit, it is possible to store much more energy than with usual manually powered appliances. Early during his studies at the Bauhaus-University Weimar, Christoph had a passion about sustainability. His main focus lies on the conception of a solution that gets to the core of the problem. It sometimes happens, that he combines very old techniques and principles with high-tech material and production- processes to find a solution for a problem. A lot of these techniques are forgotten, but with the new material, they can build a surprisingly good alternative to the standard solutions of today. That is what Christoph Thetard also did with R2B2: This simple, robust, independent and long-lasting technique turns it into a purchase that will last a lifetime. That reduces the production of waste and the use of natural resources to a minimum. The fact that R2B2 operates nearly inaudibly earns it a lot of acceptance. Christoph made the flywheel and the whole technique visible to make it understandable for everybody. 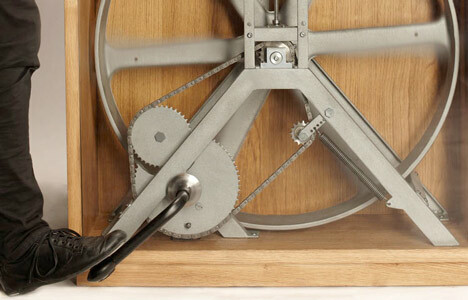 Using the pedal, it is possible to speed up the flywheel to 400 rpm. The so stored energy is enough to work one minute with 350W. With a switch at the front, you can choose between a slow, a fast or a neutral gear. R2B2 will be shown on Ambiente Talents 2011 and SaloneSatellite 2011 with StudioMontag.